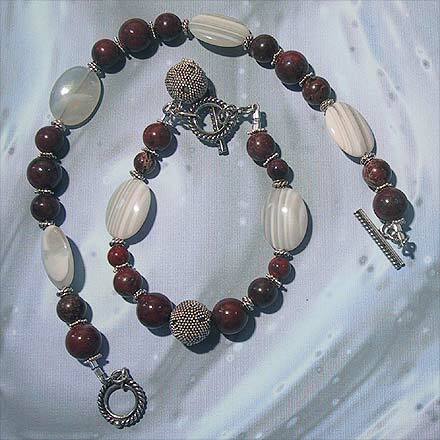 Sterling Silver Poppy Jasper and Banded Agate Anklet (outer) and Bracelet (inner). The little white specks are like stars in a red sky of Poppy Jasper in this unusual two-stone 2¼" pendant. The round milky bluish white striped cabochon is Banded Agate. The necklace is 16.9", the bracelet is 7.3" and the anklet is 10.2". For those who are interested in Astrological significances of stones, Jasper corresponds with Virgo and Leo and Agate corresponds with Capricorn and Gemini.